Now that we have received full confirmation from Capcom I will post and sticky this for everyone's use. Hey guys, sorry I haven't had the time to investigate this issue in its entirety. It seems this discussion is going into some really good depth and detail though. 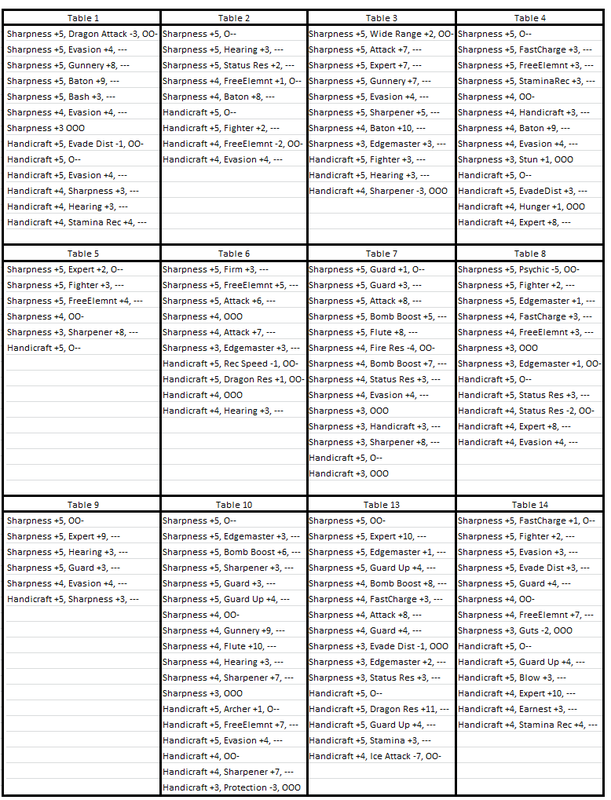 However, I finally heard back from the Dev team, and MH3U is the same as MH3G as far as charm tables go. You are locked to one table as you create your character. I did not get any reasoning behind this choice, but hopefully this won't be too much of a problem - especially with the tools you guys are finding online. Once again the feedback was sent, but I'd like to hear how you feel about this in a couple of months, and see if your impressions on the subject have changed. In other words, once you start MH3U, the table you are locked in means you will NOT be able to obtain other charms besides that table. This is ridiculous. The following is an example of how to get to table 10 (T10), use the time list for a different table. - Turn off your wireless settings. - The table gets decided the moment you select "Yes" when the game asks if you really want to create a New Game. Awesome, will definitely be trying this out, I want dat table 4. Feel free to repost it in the OP or whatever. I updated it to be a bit more clearer due to the engrish translation. Well... I think I know why the charm tables are the way they are and.... I think it's just fine. And looking over the charm tables and realizd something... Those tables without the great all mighty +5/7 or what ever charms people are saying they want or need so badly and with fewer charms than other tables... Hold something very interesting. 1. Keep in mind a table with less charms is more likely to yield more of each charm and rarer charms based on % than a table with lots of charms in it. 2. Look at the skills list. Notice some of the new skills and double effects provided by them. Which tables are those charms found on? I could be wrong but the tables may not be as broken as many may think they are. handicraft+5 stamina rec up +4. These 'cursed' tables might not be cursed at all. They're just different: they give you higher chances of getting charms that are slightly worse. -I started by closing out all software running on my 3DS. -I went into settings -> other settings -> set date for 1/21/2012 -> Ok -> Set time -> 00:12 (I was unsure about timing so wanted to give myself lots of time) I hit "Start" on my stop watch at the instant I hit "Okay" for setting the time. I wanted to give myself an extra minute. -I opened up MH3U as a fresh program from my home screen, it was not running in the background. -I positioned my cursor on "New Game"
-It then brings you to "Create your character"
-Created my character at a leisurely pace, started game, talked with Elder/etc, went into the house, slept/saved and quit out of the game. -Entirely closed out of the game from the home screen. -Went into settings, set my clock/date back to what it should be, turned wifi back on. Someone on NeoGAF got a copy early. Here's how he describes getting onto the correct charm table. Anyone know if this works on the Wii U version too? 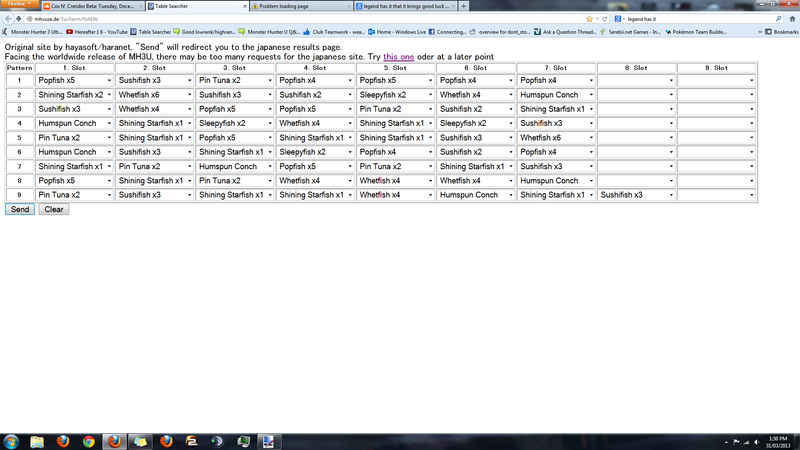 I used the charm table method on my WiiU and got table 1 according to the ship checking site, first try too. Wasn't going to restart my game even if I missed it, but happy to get it. So yes, confirmed for WiiU version. Didn't check my table... And not about to. Started using bow and the very first charm I got was on the 3rd quest I did when I randomly decided to go mining in the Flooded Forest paw pass at the port. Got a "C Range Coating c+ 7" talisman. That's good for me. I would really like to know what happens if you start your character on the times in-between the other times. Also, I'd like to know which tables people like the most. ... Umm Troy, scroll up a bit. Anyways, I still really wouldn't worry too much about what table you get or not. So far I have not hear anything bad from anyone. Hrk.. the fishing link glitched on me and I lost 6 runs of data. I'm NOT doing that again. Please tell me that there's an english translation for the one based off of charms you already own. ^ The best ones probably Athena's, posted at the top. Do you have to have to have a timer or something in time with the Wii U to start a character on a certain time? It actually sounds hard creating your character during a few second period. Nah.. You just have to start the new Game within the time period, the character creation happens after the Charm table has been set. The fishing site that I need to use to know my charm tablet doesn't work and I am not a MAC user! Any help please? So, the question - why is table 9 good for gunners? Can you give me examples of charms, why some people aim for it so badly? my understanding was that it had a higher concentration of gunner related charms. that doesn't really answer your question fully but I hope it helps. How terrible is being in a cursed table because somewhere I read that being caught in one of those tables will also stop you from getting rustshards. Is this true? Nobody has ever gotten into one of those "cursed tables." So I wouldn't worry about it. I'm pretty sure that they made it so that you cannot get into any of the "cursed tables." someone has gotten into a cursed table, my friend fueee666 is in table 17. so far it's ment he cant get certain skills on a charm at all, and that he has many multiples of charms due to the small number of available charms. edit: to rub it in he has one of the 2 tables without an edgemaster charm.